Location: Our hotel, Eger's established hotel complex, is situated in the inner city, 500 meters from Dobó Square, the historical center of Eger, and next to Gárdonyi Géza Theater, the center of cultural life. The Baroque-style Park Hotel****, the first hotel of Eger, dating back to the beginning of the last century, and Hotel Eger***superior, built at the beginning of the 1980's, following a full reconstruction, transformed into one of the most prominent wellness-conference hotels in North-Hungary, is waiting for its dear guests. The most important sights, museums and the town center's restaurants, bars and clubs are easily accessible on foot for both the self-organized traveler and the conference tourist. The adjacent Bishop's Garden, the largest park of Eger, offers recreational facilities for those who wish to relax or do sports. The popular open-air bath and the Turkish Bath with its medicinal water are situated right next to the park. Accessibility: If coming from Budapest via the M3 motorway, take exit at Füzesabony, then take one of two routes (via Kerecsend - 9 km or via Maklár/Andornaktálya - 11 km) to reach the hotel. By coach from Budapest: use the Budapest - Gyöngyös - Eger line, or the direct line leaving from Népstadion station in Budapest. By train: using the Intercity train, the comfortable journey to Eger takes only one and a half hours. Room information: 205 comfortable rooms with modern furniture, most of them are air-conditioned; the hotel offers rooms with either a bath or shower, most of them also feature a balcony. Mini bar, Internet access, cable TV, Pay-TV, telephone and hair driers are also available. Some of our rooms may be reserved equipped with an extra bed. Services: Wireless Internet access, conference rooms, central safe at the reception, hairdresser's, facial and body care salon, pedicure . manicure - artificial nails, room service, closed parking lot, pool tables, children's corner, child-care, room for the disabled, non-smoking rooms, program arrangements, tour guides. Services for natural medicine: chiropractor, foot reflexology. Pets are welcome for a charge. Dining facilities: Our conference room seating 700 persons, together with the adjacent gallery section is capable of holding exclusive gala dinners and standing receptions, too. 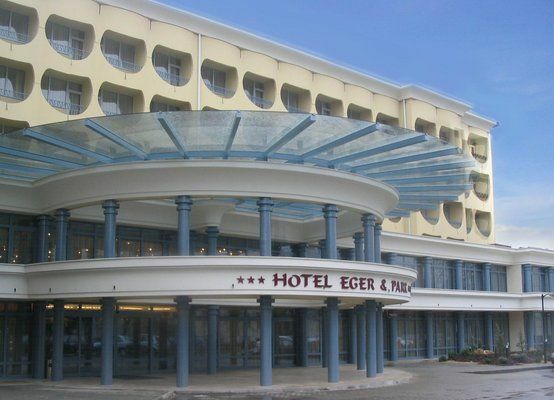 Besides the impressive restaurant of Park Hotel (White-Yellow-Green Halls), another restaurant is available in the Hotel Eger section, seating 120 guests. With its movable walls, the restaurant is perfectly suitable for private dinners and other private events. In the summer season we offer open-air grill cooking on a wonderful terrace belonging to the restaurant. The ground floor drink bar offers piano music and a pleasant evening place to relax. Other entertainment facilities include the hotel's Bowling Bar with its renewed interior, two new bowling lanes and two large American pool tables, and the night bar located below the Park wing. The Park Hotel wing with its exclusive coffee and cigar lounge, invoking the atmosphere of the 20's, also offers an extraordinary experience. Adjacent to the hotel, the Ice Cream Garden is now open again to the public with cocktails and various special ice creams and drinks. The bar of the wellness section offers refreshments to be enjoyed after a relaxing wellness-afternoon. Our hotel boasts Eger's oldest monument-type cellar, called Istenes Cellar, which is located in the Szépasszony-völgy (Valley of the Beautiful Lady). The cellar consists of three sections, altogether seating 170 persons. The cellar is perfect for dinners and wine-tasting accompanied by gipsy music and the installation of a "wine general". Since its reconstruction in 2004, the cellar also offers a wonderful, roofed terrace that is in harmony with the atmosphere of the surroundings, and seats 200 persons, as well as parking lot also suitable for buses. 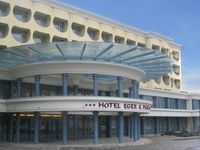 Conference facilities: The hotel offers the largest conference room in the North-Hungarian region, capable of seating 700 persons. The room furnished with the most advanced technical equipment features natural lighting and sound-proof movable walls, which enable the room's division into several sections. An approximately 1,000 sq m service area attached to the conference room is perfect for coffee breaks, exhibitions and standing receptions. In addition to the main conference room, there are smaller rooms in various sizes available for business meetings, partner or client group meetings. Wellness: In addition to the swimming pool, our wellness center also offers a fun pool and a bubble bath. The sauna displays a brand new interior. For those seeking refreshment, the cabin row features ice, steam, aroma, light, infra and salt cabins. With its newest cardio and conditioning machines, the air-conditioned fitness room invites the guests for a work-out. Additional services offered by the wellness section: solarium, wellness baths, body treatment, fitness and aqua programs. Our masseurs help to revitalize both your body and soul. We also offer general curative and special massages (e.g. Dead Sea salt-peeling massages, aromatic honey massages). Bathrobes and swim caps are available for rent. Our therapeutic section offers hydro- and balneo-therapy (underwater spray massage, fango) and physiotherapy (curative massage, therapeutic gymnastics, elektro therapy, ultrasonic treatment), following an examination by a rheumatologist specialist performed within the social security system. The services provided by the spa (curative massage, tangetor, therapeutic gymnastics and mud-treatment) are financially supported by the Hungarian social security system, and are also available at a discount price to the citizens of the European Economic Community holding a health Security Card (form). The curative and medicinal baths located in or around Eger - Turkish Thermal Bath, Thermal Spring at Egerszalók, Spa in Bogács, Zsóri Bath in Mezőkövesd - also offer unique opportunities for our guests seeking cure. • The hotel's own parking lot is available for the guests at 1300 HUF per car per day. • Pets are allowed for an extra charge of 3200 HUF per day.